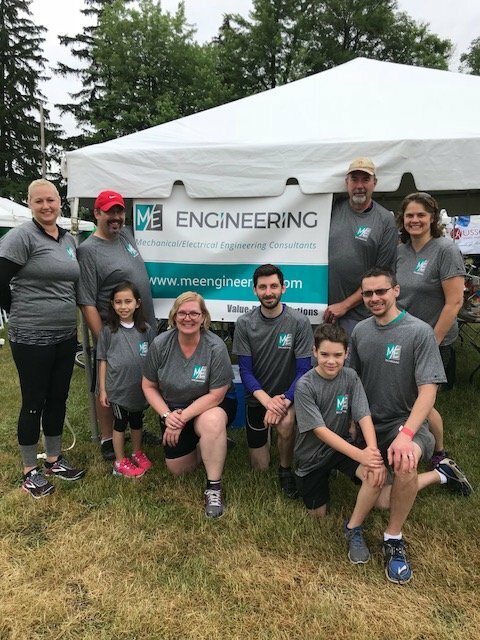 On Saturday, June 23rd, M/E Engineering's eleven-member team participated in the Ride for Roswell. Members of the Buffalo Office and their family members cycled different routes ranging from 3 miles to 65 miles. One of our newest team members, Casey Stewart, daughter of Rob Stewart, rode 3 miles and is only seven years old! Jacob Richards, Mike Richard's nine year old son rode 30 miles! Welcome to Ken and Linda Swan who rode with our team for the first time this year and completed a 20-mile ride! Despite rain and thunderstorms in the forecast, it was a great event! Thanks to all who participated in this worthwhile and fun event! This year, 7,740 riders and 2,000 volunteers participated in the Ride for Roswell, raising $5.2 million dollars!